This glorious, Turkish-made Fabio Ricci Goran Medium Hard Cover Notebook stands out among peers for any number of qualities. 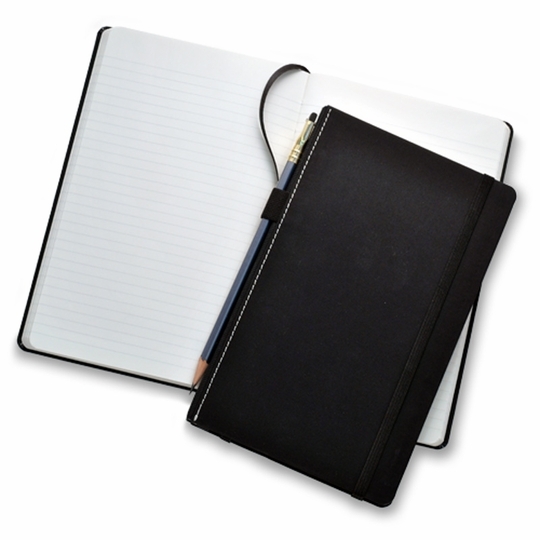 Not only does it include the usual features of the elastic closure, ribbon marker and interior pocket, but it boasts an attractive and durable saddle-stitched canvas cover and--the true excitement--an attached pencil loop (pencil sold separately) to keep your favorite writing instrument always at hand! No more scrabbling at the bottom of your satchel: your pencil is always available to scribble and sketch away on the 160 ivory pages of acid-free 80 g paper.